Pork, valued for its versatility and health profile, is becoming more popular in non-commercial operations. Pork, always a versatile product, became a “hot” item on menus this year as operators served up virtually every part of the animal from snout to tail. 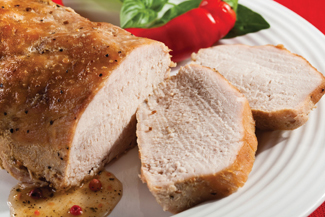 At the same time, foodservice directors found “comfort” versions of pork dishes to be extremely popular as they incorporated “the other white meat” into a wide variety of applications. One reason could be the perceived health value of pork. According to the National Pork Board, the six most common cuts of pork are 16% leaner and have 27% less saturated fat than 15 years ago. At BCBSSC, with four cafeteria locations, barbecued pork is very popular with employees. “We’ll also do fried pork chops, like a schnitzel, over noodles,” he says. However, John Gray, executive chef at the University of Maryland, is puzzled by the lack of pork’s popularity with Maryland students. “I’ve been here since January and it’s very difficult to sell it,” Gray notes. “We had a couple of items on our value menu, like a smothered chop that was oven baked and served with mashed potatoes andvegetable, and none sold. Gray hopes meetings with a student advisory group will help find an answer, especially since he says pork has good food cost and can be used in a variety of preparations. 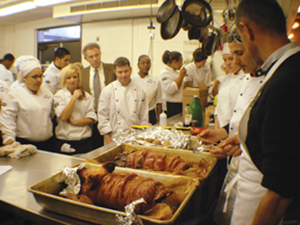 In contrast, James Berman, foodservice director at Delcastle Technical High School in Wilmington, Del., has luck with numerous pork dishes. “We have 1,501 students and we use a lot of pork, especially for catering wedding rehearsal dinners and community events,” Berman says. In Hudson, Ohio, Maureen Faron, director of nutrition services for the Hudson City School District, which serves 4,000 meal equivalents a day, does several hot sub rotations including a pulled pork item from the commodity program at the middle and high schools. The heat-and-serve shredded pork lends itself to a premium sandwich that’s one of the top five picks in grades 6 to 12, she says. “We try to follow fast food trends, and instead of a pressed rib sandwich, we do pulled pork barbecue style on hoagie buns,” Faron explains. She also serves pulled pork sliders as an à la carte item. At St. Tammany Parish Hospital, Covington, La., Executive Chef-Manager Abry Crosby creates his own seasoning blend for pork ribs in the cafeteria and brines pork butts, adding dry rub vinegar. A pork tenderloin seasoned, grilled and served with a mango salsa is a big seller, he says. In addition to being healthy, pork fits the sustainable profile, according to YUDS. Yale University Dining Services believes its mission is to create “great fresh food that tastes great.” With a focus on environmentally responsible food purchasing, the program, which operates 27 residential and retail foodservice outlets, has a history of working with local and regional farmers, most recently through its Local2Yale initiative. By 2013, the school anticipates that 80% of all animal protein served will be sustainable. That’s important to Executive Director of Campus Dining Rafi Taherian, who points to the fact that pork has a lower CO2 “equivalence” (35 kg) than beef (120 kg). When considering pork as a menu option and opportunity, Taherian points to four primary elements that make it a preferred option: neutrality of flavor, the low price point, the fact that it’s a “white” meat and sustainability. Pork is sustainable, he says, because the carbon footprint is significantly less than that of beef. For those reasons, Taherian notes that pork now fits in even more perfectly as a menu element because of the school’s sustainability commitment with regard to protein purchases, which includes a gradual reduction of lamb and beef along with a transition to more seafood, poultry and pork. He recently introduced a stuffed chop, braised pork bellies and pork loin into Executive Services menus. At Greenwich Hospital, foodservice takes advantage of pork's health profile on patient and cafeteria menus. Suzanne Magnotta, R.D., manager of nutrition services at Greenwich Hospital, Greenwich, Conn., started looking closely at menus about a year ago, after a random sampling of its 1,500 employees showed many had such health issues as high cholesterol, high blood pressure and obesity. The 176-bed facility adopted California’s workplace guidelines for nutrition, analyzed recipes and came up with a color-coded menu for its Nutmeg Grill and Garden Café, to help raise customer awareness of the healthfulness of menu choices. Nutritionists and chefs worked with the hospital’s Center for Healthy Living in coding the menu items. “We wanted to provide a healthy workplace environment for our employees. We color coded the menus in the cafeteria in three categories–excellent (green), good (yellow) and fair (red), which lets people know immediately that green was the best, healthiest choice. We started out with 65% of the items falling into the green or yellow category, but we plan to up that in six months to a 75%-25% ratio. We also have nutrition values posted on a screen at the entrance to the cafeteria for quick comparisons. A lot of our pork items fall into the green category because they’re low in saturated fat. We do some pork loin and grilled pork chop items and they’re healthier than chicken with skin and a fatty sauce. When we grill pork, we cook it with spices and herbs. We had to lower the portion size from six to five ounces, but we’ve had no customer complaints, although now they are smaller than a typical restaurant-size portion. We discovered that we were serving a lot of food. Some of the items before were around nine ounces, but those were not portions of meat. Pasta items may have been that large previously. It took us about a year to look at, analyze and modify our recipes. We could’ve made everything fit into the guidelines by cutting fat and salt, but we wanted it to taste good. The portion size was definitely the biggest challenge to getting the menu items to be healthy. We used a lot of salty sauces and we found that we had to cut the sodium content and use more herbs and spices to bring out flavors. We also worked with our vendors to find sauce bases that were lower in sodium. On the patient menus, which are on an eight-day cycle, various menus are broken down for dietary restrictions. Patients on low-sodium diets only receive those menus. We do a baked pork chop with apple stuffing and a roast loin of pork with gravy on the patient menus. We also have a fresh-roast ham with gravy, a baked ham with raisin sauce, a ham sandwich, a turkey club sandwich and a ham salad platter. And at breakfast, we have bacon and sausage available.We are starting to change our patient menus to offer more variety for next year. In the cafeteria, we do a sesame pork stir-fry, a grilled pork chop, an Asian-spiced pork loin and a pork chop with a cabbage casserole. We also have a ham sandwich and ham with raisin sauce. We have a high population of Jamaican workers here and we’ll do a Jamaican pork shoulder that is jerk-marinated. It is higher in fat and salt than the healthy pork items, but it’s really good. We found that pork fits into our categories well because it’s lean and low in cholesterol. It tends to be leaner than a steak of equal serving size. If you compare a three and one-half-ounce beef sirloin steak with the same size sirloin pork chop, the beef has nearly 90 milligrams of cholesterol while the pork chop has 81 milligrams. In terms of fat, the beef sirloin steak has eight grams while the pork chop has only six grams, and the beef has 200 calories compared with 175 calories in the pork chop.